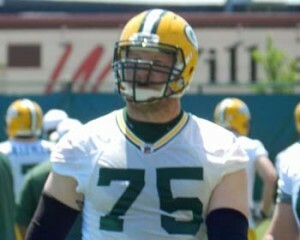 The Green Bay Packers are parting ways with veteran offensive lineman Don Barclay on Tuesday. They released him off of injured reserve, just one week before he would have been eligible to come off of the list. Without Barclay, the Packers have gone to backups Justin McCray and Lucas Patrick and appear to be satisfied with their play, making Barclay expendable. Barclay came into the league as a tackle and struggled at times when he was asked to play. He eventually spent more time at guard and center. He suffered an ankle injury in the first exhibition game in August and was put on injured reserve when the team made their final roster cut to 53 players. Barclay played in a total of 62 regular-season games with 24 starts. The Packers signed wide receiver Max McCaffrey to their practice squad after he was released Monday by Jacksonville. McCaffrey originally joined the Packers as a member of their practice squad Dec. 20, 2016, and was added to their active roster for the NFC Championship game. McCaffrey also spent a week on the Saints practice squad after the Packers released him on the cut to 53. 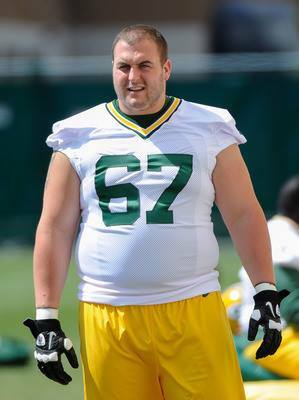 The Green Bay Packers sent yet another offensive tackle to Injured Reserve on Tuesday, joining Don Barclay and Jason Spriggs. Kyle Murphy, who started the opener against Seattle at right tackle and then the next two games at left tackle, suffered a foot injury in Sunday’s win over the Bengals. Murphy was in the locker room on Tuesday, wearing a protective boot and using a knee scooter. He could return after eight weeks, but the Packers can only bring back two players by NFL Rule. The Packers host the Chicago Bears on Thursday night and Mike McCarthy doesn’t know who his starters will be. Both David Bakhtiari and Bryan Bulaga practiced on a limited basis on Tuesday. The two players started all 19 games together last season but have yet to do so this year. The Green Bay Packers finally finalized the signing of free agent outside linebacker Ahmad Brooks and made a handful of other moves as they move into game week. The Packers claimed outside linebacker Chris Odom off waivers from the Atlanta Falcons and traded outside linebacker Jayrone Elliott to the Dallas Cowboys for a conditional seventh round draft pick in 2018. 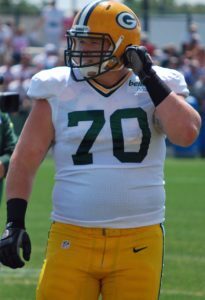 To make room for Brooks, the Packers placed offensive lineman Don Barclay on injured reserve with the option of designating him for return after eight weeks of the season. The move explains the Packers keeping both Justin McCray and Lucas Patrick. Both players could serve as Corey Linsley’s backup center this week when the Packers open the season at home against Seattle. The Packers now have five offensive lineman on the roster. The Packers waived both Taysom Hill and Joe Callahan. Hill wound up being picked up by New Orleans, while the Packers signed Callahan to their practice squad. The Packers also released defensive tackle Brian Price. He was claimed by the Cowboys. The Packers may not be done yet, but they do return to the practice field Monday afternoon. Tuesday is an off day with more workouts set for mid-week. While the Green Bay Packers wouldn’t be mathematically eliminated by losing at Philadelphia tonight, but their post season chances would take a major hit. The Packers (4-6) will try to end a four-game losing streak against the Eagles (5-5) at Lincoln Financial Field. The Packers expect to get a pair of defensive starters back tonight. Both cornerback Damarious Randall and linebacker Jake Ryan are expected to play. The Green Bay Packers start their preparations today for Sunday’s prime time matchup against the Washington Redskins and they expect to be without another starter. Right guard T.J. Lang left Sunday’s game with what was thought to be an ankle injury. But Lang said Tuesday that the injury is a foot injury, not the ankle. He expressed his disappointment after saying he expects to miss several weeks moving forward. The Packers are already playing without starting center J.C. Tretter and left tackle David Bakhtiari left last week’s game with a knee injury. Bakhtiari said Monday that he expects to be day-to-day and wouldn’t rule out playing Sunday night. Don Barclay expects to move into Lang’s spot at right guard. Left tackle David Bakhtiari, who missed three straight games with an ankle injury, is expected to return to the lineup for the Green Bay Packers when they face Arizona in the NFC Divisional Playoffs. 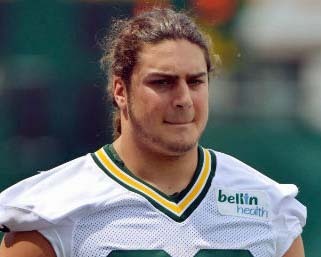 Bakhtiari sat out Friday’s practice, but was listed as probable on the Packers latest injury report. In his absence, the Packers used Don Barclay, Josh Sitton and J.C. Tretter. Tretter held his own in last week’s wildcard win at Washington. Barclay and Sitton struggled previously. After undergoing surgery to repair a sprained M-C-L and torn meniscus in his left knee, Green Bay Packers right tackle Bryan Bulaga was projected to be out four-to-six weeks. But Bulaga returned to practice less than three weeks after the injury, going through a non-padded workout on Wednesday. If everything checked out from Wednesday’s workout, Bulaga said he plans to practice in the teams padded practice on Thursday. There is no guarantee that Bulaga will be able to play against the St. Louis Rams on Sunday, but his return is a good sign. 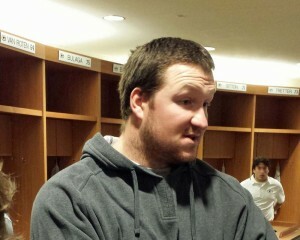 The news is worse for the Green Bay Packers and their starting right tackle Bryan Bulaga. It was learned on Saturday that Bulaga is expected to miss four to six weeks because of the left knee injury he suffered in practice on Thursday. The NFL Network reported that Bulaga had surgery to repair a torn meniscus. The team initially said Bulaga’s injury wasn’t deemed to be serious and announced he would miss this Sunday’s game against the Seahawks. But further tests revealed the meniscus tear. It’s the same knee that Bulaga blew out in August 2013, when he tore his ACL in a preseason scrimmage. He missed the entire season after undergoing surgery. Don Barclay is expected to take over at right tackle in Bulaga’s absence with his first test coming against Seattle on Sunday night. Green Bay Packers head coach Mike McCarthy ruled his starting right tackle Bryan Bulaga out of Sunday night’s home opener against the Seattle Seahawks with a knee injury. Bulaga left Thursday’s practice during individual drills and trainers were looking at his left knee. He was replaced in practice on by Don Barclay, who is expected to start Sunday night against Seattle. 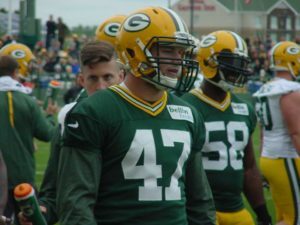 The Packers could also go with Josh Walker, a street free agent who was signed to the Packers’ practice squad in September of 2014 and was active in last Sunday’s season opener at Chicago.